CM: A 17-year-old man presented to the Emergency Department with chest tightness, cough and left-sided chest pain. He had been diagnosed with mixed connective disease as a child, having had Raynaud's syndrome associated with a positive antinuclear antibody with a speckled pattern and a positive ribonucleoprotein (RNP) antibody. He had never experienced respiratory symptoms or exercise limitation before. He had never smoked tobacco or cannabis, or been exposed to industrial dusts or chemicals. 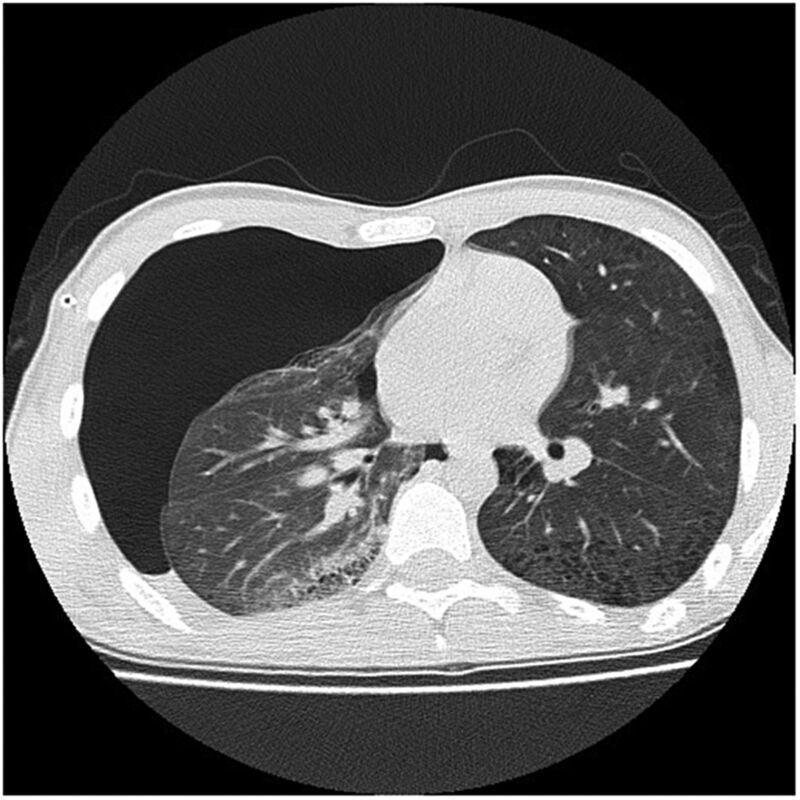 A chest radiograph revealed a spontaneous left-sided pneumothorax. A chest drain was inserted, with rapid resolution of the pneumothorax. Eleven days later, he developed a spontaneous right-sided pneumothorax, which failed to resolve with a 12Ch seldinger drain. A CT scan of the chest was performed (figure 1). AP: The CT chest shows a large residual pneumothorax with mediastinal shift, drain in situ, and extensive, mainly subpleural, cystic change in both lungs, upper and lower lobes. This suggests advanced emphysema. I see that the α-1 anti-trypsin level is normal, therefore a lung biopsy should be obtained to further characterise his disease and search for a cause. CM: The patient underwent a right video-assisted thoracoscopic surgery (VATS) bullectomy and pleurectomy, with wedge lung biopsy. Three days after discharge, he developed a further left-sided pneumothorax, with mediastinal shift. Another chest drain was inserted and within a week he underwent a left-sided VATS bullectomy and pleurectomy, with wedge lung biopsy. Echocardiography and capillary blood gases were normal. AN: The right and left lung biopsies both showed bullous emphysema, often immediately subpleural, with reactive pleural changes. There was no persuasive evidence of interstitial lung disease that could be attributable to scleroderma. There were no signs of vasculitis, granuloma formation or evidence of malignancy. There was obvious constrictive bronchiolitis (figure 2). A representative slide of lung biopsy, kindly provided by Dr Paul Craig, Cheltenham General Hospital. CM: This patient has also had serial lung function tests due to his childhood diagnosis of scleroderma. They show a high residual volume in keeping with emphysema (table 1). HJ: This young man was seen in September 2005 in Birmingham Children's Hospital Childhood Arthritis and Rheumatic Diseases Unit where it was noted that he had a history of Raynaud's syndrome, clinical evidence of sclerodactyly, facial skin tightness, abnormal nail fold capillaries and arthritis at the wrists, elbows and knees. He also had episcleritis and iron deficiency anaemia. It was noted that he had a positive RNP. dsDNA was not elevated. There was no evidence of antiphospholipid syndrome. Scl70 and centromere antibodies were negative. He had a weakly positive rheumatoid factor. It was felt at the time that he most probably had an overlap syndrome but the features were predominantly that of scleroderma. At this point he was commenced on methotrexate which was then withdrawn in 2008. Methotrexate was commenced for the inflammatory arthritis which was evident in 2005; withdrawal of methotrexate has not had any adverse effect on his joint symptoms. He did not experience any respiratory side effects from the methotrexate. CM: Despite undergoing bilateral pleurectomies, 2 months later the patient developed another left-sided pneumothorax, though this was small and loculated. AP: This patient's case is clearly unusual, and there are no other reported cases in the literature. A specialist review in a national centre is required. CM: The patient and the lung biopsy specimens were reviewed at the Royal Brompton Hospital. AN: Examining the lung biopsy slides, it appears the changes are mainly those of subpleural emphysematoid change rather than a diffuse cystic lung disease. I am uncertain how this might relate to the patient's collagen vascular disease, although it is conceivable that this may be damaging his airways, which in turn has led to the formation of the cysts and subsequent pneumothorax. However, I emphasise that this is no more than theory. CM: The Royal Brompton team advised that the current management of this condition involves referral to national specialist services and close monitoring of lung function and CT chest changes. If fibrotic changes develop, immune-modulatory treatment will be required. The prognosis is unknown. The patient is currently being followed up as an outpatient. He has some ongoing post-surgery chest discomfort. He had no noticeable desaturation on a recent cardiopulmonary exercise test. AW: There is an increasing body of thought that immune dysregulation/autoimmune disease may be part of the pathogenesis of smoking-related emphysema.1 We see a number of lifelong non-smoking patients with autoimmune disease and interstitial lung disease when there is also emphysema. Acknowledging that numbers are low, this phenomenon of combined pulmonary fibrosis and emphysema was seen in two of 20 patients with connective tissue disease and interstitial lung disease.2 This suggests that autoimmune pathways can produce emphysema. It is logical that this would be seen in those patients who also have pulmonary fibrosis—as emphysema and pulmonary fibrosis have common pathways, including oxidative stress, matrix dysregulation and protein citrullination. If an association between connective tissue disease and emphysema (without fibrosis) exists in non-smokers, it must be very rare (because shared mechanisms are likely to lead to concurrent pulmonary fibrosis). Therefore, we report the current case in the hope that it may prompt others to report similar cases, thus building up a literature experience.
. The pathogenesis of COPD and IPF: distinct horns of the same devil? Respir Res 2012;13:3.
. Combined pulmonary fibrosis and emphysema syndrome in connective tissue disease. Arthritis Rheum 2011;63:295–304. Correction notice This article has been corrected since it was published Online First. The correspondence address has been amended. Contributors CM: reviewed case notes, wrote parts of case (as indicated) and collated contributions from the other authors, obtained images, obtained informed consent from the patient. Corresponding author. AP: consultant respiratory physician in charge of the patient’s respiratory care, suggested writing case report for this patient, wrote parts of case (as indicated), reviewed drafts and suggested improvements. HJ: consultant rheumatologist in charge of the patient’s rheumatological care, wrote part of the case (as indicated). 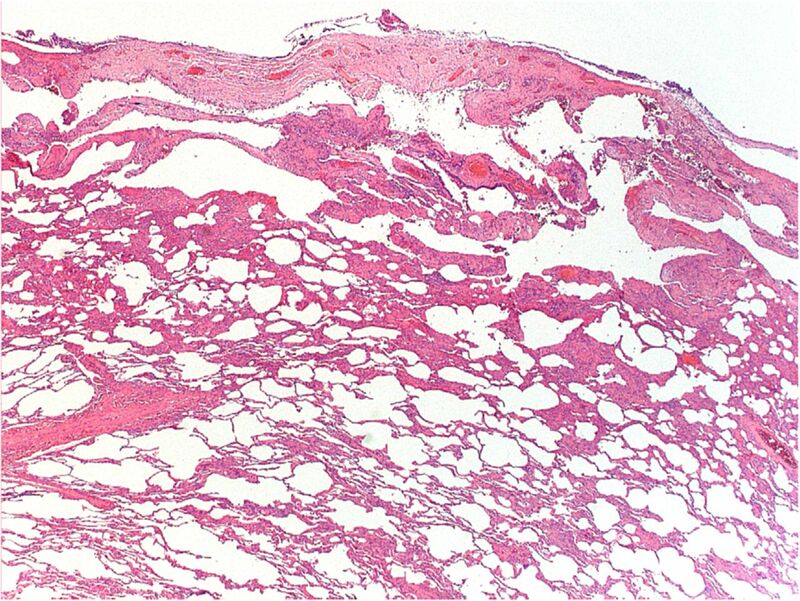 AGN: consultant histopathologist and professor of respiratory pathology, reviewed the pathology specimens and wrote part of the case (as indicated). AW: consultant respiratory physician, reviewed the patient in specialist clinic at the Royal Brompton Hospital and wrote part of the case (as indicated).